Last update (Jun 15, 2009): Initial impressions by Steve aka Tekmar. 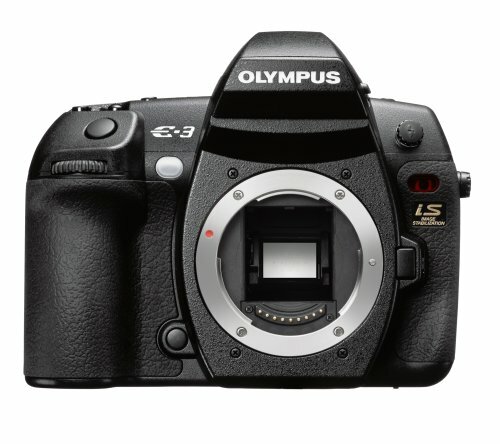 This post is a compilation of annotated links to Olympus Evolt E-3 digital SLR professional and user reviews, tests, ratings, conclusions, sample photos, image galleries and other references. The Olympus E3 is a Four Thirds 10.1 MP digital SLR and was announced on 16-October-2007 — read the press release and get the full specs. The official website for the E3 is at OlympusAmerica.com. Steve’s forum post is pretty detailed, 14 points in total covering the pros and cons of the E3. There are 42 images in this review gallery. I’ve provided a short description of each photo and the lens used. Clicking on the photo’s image number opens up the full-sized, original JPEG image. Image 1: Fallen tree trunk, Olympus 12-60mm lens, ISO 100. Image 2: Dead tree in mist. Olympus 12-60mm lens, ISO 100. Image 3: Ice-covered fern leaf. Olympus 50mm f/2 Macro lens, ISO 100. Image 4: Rocky landscape. Olympus 12-60mm lens, ISO 100. Image 5: Castle remains. Olympus 12-60mm lens, ISO 100. Image 6: Misty landscape. Olympus 12-60mm lens, ISO 100. Image 7: Solitary tree. Olympus 12-60mm lens, ISO 100. Image 8: Dew drops on grass. Olympus 50mm f/2.0 macro, ISO 100. Image 9: Gnarled tree trunk. Olympus 12-60mm lens, ISO 100. Image 10: Young boy looking at his archery set. Olympus 50mm f/2.0 macro, ISO 1600. Image 11: Boats. Olympus 12-60mm lens, ISO 100. Image 12: The Angel, a cobbled road, blue sky and clouds. Olympus 12-60mm lens, ISO 100. Image 13: Railway Avenue SE16 sign and building. Olympus 12-60mm lens, ISO 100. Image 14: Apartment block and street lights. Olympus 50-200mm f/2.8-3.5 lens, ISO 100. Image 15: A street light. Olympus 50-200mm f/2.8-3.5 lens, ISO 100. Image 16: Broken window bathed in golden light. Olympus 50-200mm f/2.8-3.5 lens, ISO 100. Image 17: Two glasses. Olympus 50mm f/2.0 macro, ISO 100. Image 18: Snapshot portrait of a young child. Olympus 12-60mm lens, ISO 100. Image 19: Colorful roller shutter doors. Olympus 12-60mm lens, ISO 100. Image 20: Statue on log. Olympus 12-60mm lens, ISO 100. Image 21: Building construction at 36mm (72mm equivalent). Olympus 12-60mm lens, ISO 100. Image 22: Building construction at 12mm (24mm equivalent). Olympus 12-60mm lens, ISO 100. Image 23, image 24, image 25, image 26, image 27 and image 28: Buildings. Olympus 12-60mm lens, ISO 100. Image 29: Flags at The Star. Olympus 12-60mm lens, ISO 100. Image 30: Solitary tree and great weather. Olympus 12-60mm lens, ISO 100. Image 31: Shoot into the sun. Olympus 12-60mm lens, ISO 100. Image 32: Ducks at a small lake. Olympus 12-60mm lens, ISO 100. Image 33: Dry grass close-up. Olympus 12-60mm lens, ISO 100. Image 34: Natural light portrait of a young child. Olympus 50mm f/2.0 macro, ISO 400. Image 35: Close-up of leaves. Olympus 50mm f/2.0 macro, ISO 100. Image 36: Outside, at dusk. Olympus 12-60mm lens, ISO 1600. Image 37: Ernst & Young building, at night. Olympus 12-60mm lens, ISO 1600. Image 38: Pedestrian bridge, at night. Olympus 12-60mm lens, ISO 1600. Image 39: View camera. Olympus 50mm f/2.0 macro, ISO 100. Image 40: Display shelf. Olympus 12-60mm lens, ISO 3200. Image 41: Statue of Mother Mary. Olympus 12-60mm lens, ISO 800. Image 42: Building. Olympus 12-60mm lens, ISO 100. Richard Pavek shared six photos of an Australasian Gannet, Yellow-nosed Albatrosses, juvenile Shy Albatross and Grey-headed Albatross in this forum post. All the images were shot with an Olympus Zuiko 90-250mm f/2.8 lens.